Nebraska, McCant 9-124, Brown 18-118, Achola 7-58, Jones 10-51, Lance Lewis 2-41. Nebraska, McCant 9-13-0-144, Mickey Joseph 3-5-0-19. Missouri, Kenneth Dunn 4-69, Jerome Madison 3-30. Nebraska, Kenny Wilhite 1-17, Lorenzo Brinkley 1-0. Washington 5-4-9, Maurice Benson 4-4-8, Mario Johnson 4-4-8. 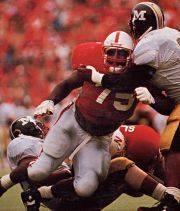 Nebraska, Mike Anderson 3-6-9, Steve Carmer 3-4-7, Curtis Cotton 1-5-6. Nebraska, Ryan Barry 1, Terry Connealy 1, Greg Fletcher 1, Travis Hill 0.5, John Parrella 0.5. Although it didn't look like it in the opening minutes, things were back to normal in Memorial Stadium as ninth-rated (AP) Nebraska smashed Missouri, 63-6, to set up a Big Eight showdown at Colorado the following Saturday. Like what Kansas State had done in the previous week's nail-biter, Mizzou stopped Nebraska on its first offensive possession, then drove deep into Husker territory to take a 3-0 lead on Jeff Jacke's 42-yard field goal. But, unlike K-State, which battled NU all the way to the end in a 38-31 loss, the Tigers were never in it again. Nebraska roared to three touchdowns for a 21-3 lead at the end of the first quarter, and averaged 13.5 yards per offensive play in the three drives. The Huskers went on to score touchdowns on eight consecutive possessions and handed Missouri its fifth-worst loss ever. By halftime Nebraska had a 42-6 lead, with 398 total-offense yards, and the Huskers went on to accumulate 681 in the game, including 511 on the ground. Quarterback Keithen McCant had 268 total yards before a shoulder bruise sidelined him early in the third quarter. McCant completed nine of 13 passes for 144 yards and three scores while rushing for a career-high 124 yards and a TD on nine carries. He would win Big Eight offensive player-of-the-week honors. I-back Derek Brown chipped in 118 yards and two TDs on 18 carries to extend his string of 100-yard games to seven, the third-longest in Husker annals. The option series was open all day for Nebraska. Through the first three quarters, NU ran outside 19 times for 211 yards, averaging 11.1 yards per play. The Huskers had six touchdown drives of at least 60 yards, with five of over 70 yards and two over 80. The defense, meanwhile, held Missouri's 25-point-a-game offense without a touchdown. The Blackshirts yielded 261 yards and forced three turnovers, all of which turned into touchdowns. Mizzou fell to 1-2 in the Big Eight, 3-3-1 overall. Quote of the game: "The option was pretty much there whenever we wanted it." - Nebraska quarterback Keithen McCant.